"These are sweeter than traditional Brussels Belgian waffles - a sweeter waffle that can be served for breakfast or dessert. 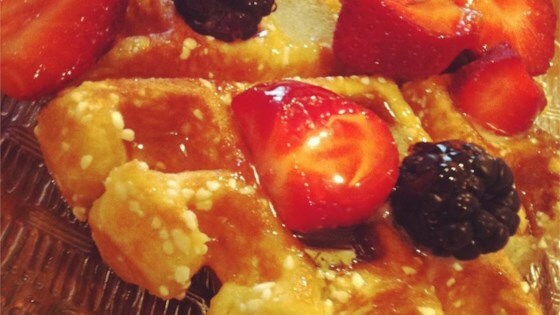 Serve waffles warm or cooled with whipped cream and berries or drizzled with warm, melted chocolate. " Place a baseball-size ball of dough on the preheated waffle iron. Cook waffles until golden and crisp, about 2 minutes. Repeat with remaining dough. Allow waffles to cool for 2 to 3 minutes before serving. Deep, fluffy yeast waffles with crispy edges and soft centers. In a pinch, you can break sugar cubes into 4 to 8 pieces. Swedish Pearl Sugar can also be used. Dough balls may be wrapped in plastic wrap or wax paper and refrigerated overnight.